A day after the media frenzy surrounding the resignation of the Oracle of Omaha's number two man, Warren Buffett made a surprise announcement, naming his successor: a 44-year-old unknown hedge fund investor from Omaha named Josephine Synkowitz. Not only did the timing of the announcement come as a shock, but so did the naming of Synkowitz -- an outsider to the Berkshire Hathaway empire, a largely unknown quantity, and a woman. In a press release, Buffett called the Omaha-native Synkowitz a mix between "Zoe Cruz, Hilary Clinton, Mae West and Annie Oakley." Buffett also hailed Synkowitz, the mother of four boys, for her fierce competitive spirit, pointing out that she was the ace relief pitcher for the U.S. women's softball team that won gold at the Olympic Games in Atlanta. In addition, at the University of Nebraska, Synkowitz lettered in six sports: tennis, swimming, softball, soccer, track and field, and cross country. Along with holding two NCAA cross country records (in the 5K and 6K), Synkowitz holds a B.S. in economics and B.A. in comparative literature from Nebraska, and a Ph.D in economics from Oklahoma State. The highlight of her professional career includes running Synkowitz Capital Partners for the past 12 years, during which she put up double-digit returns in every year except 2008 (when she returned 9.2 percent). Of naming a women to run Berkshire Hathaway upon his retirement, the always outspoken Buffett noted that "it's become quite obvious that men are running this country into the ground. The world, too, for that matter. Heck, we just witnessed a near worldwide economic collapse and aren't learning a doggone thing from it. What's changed? Nada. And I don't see any women in top positions making the inane decisions the boys are making. I'm not leaving myself out of that, either." 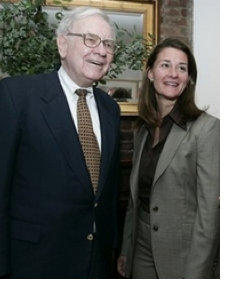 Plus, Buffett said, "Joe is just the right woman, or man, for the job. I trust she'll lead Berkshire Hathaway with integrity and honesty and will kick some tail as we continue to grow in the next two to three decades." Buffett conspicuously did not mention David Sokol in the release, or others (such as Ajit Jain and Tony Nicely) within the Berkshire Hathway family who had largely been seen as front-running successors. Already, analysts and industry observers are calling Synkowitz "the Matriarch of Omaha."